Norman Racki lost his life going up the stairs at American Legion Post 721. But the tragic incident inspired action. It was back in October when a Korean War Veteran fell down a flight of stairs at a veteran's post in South Buffalo and died. There was no elevator for him to get upstairs..
Work is now underway to make sure accidents like that never happen again. The American Institute of Architects is now inspecting veterans posts in Western New York, and working on floor plans to make them handicap accessible. "Architects from our chapter inspected many posts in Erie County to identify required maintenance and compliance with building codes," said Kenneth McKay, President of the AIA local chapter. "It is gratifying to see that the first of these projects are completed." Restaurant owner Russell Salvatore, who is also a veteran, donated $50,000 dollars to American Legion Post 1320 in Sloan to make its restrooms handicap accessible. I've seen the facilities that they had and it was impossible for a wheelchair to get into the room it took me like about 10 seconds to say yes," said Salvatore. The project is one of several projects the AIA hopes to complete. 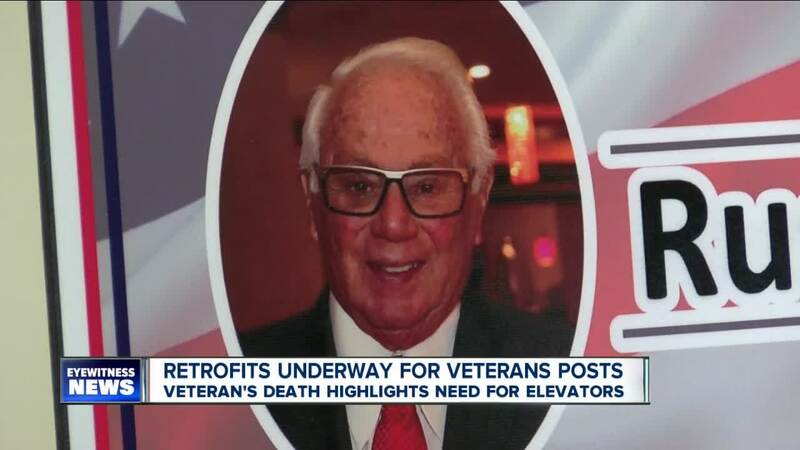 Erie County Klerk Michael Kearns was able to secure $250,000 for an elevator for post 271. "These posts which are the community hub for many of our veterans. This is the place where you go, and they go to celebrate, to remember, and to honor those who have made the ultimate sacrifice," he said. The Veterans Post Restoration of Erie County raised $10,000 from selling flags last November. That's when Salvatore surprised them with his donation. "I'm so happy and proud to have my name associated with this post," said Salvatore. Jerry Kowalski, Vice President of the Veterans Post Restoration, said the group will continue to work with the community to raise funds and apply for grants to make all veteran posts more handicap accessible.